The danger of comedy, particularly when it comes to parody, is that sometimes it can unintentionally reveal just as much about the attitudes of the comedian and their audience as it does about the things they are spoofing. Take, for instance, HoL. 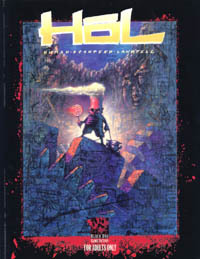 A deliberately sloppy mess of a game, HoL was initially self-published by Dirt Merchant Games. The guys at White Wolf caught wind of it, and thought it was so funny that they reprinted it under the Black Dog Game Factory imprint, which they used for material too spicy for the White Wolf label like Montreal By Night. This is, in itself, pretty funny – because whilst much of the overt sniping in HoL is directed at other targets, some of the attitudes that creep in end up making it an accidental (but quite apt) spoof of game design fashions and the RPG zeitgeist of the time.